Challenge yourself in mixing more than a style in a look, you'll be pleased with the result. Take mine for an instance, this is the look I wanted to achieve with the combination of my boyish chunky sweater and sophisticated heels. Grunge with a touch of sophistication. Easy, eh? Now talking about 3 trends worth to try before it's finally vanished. When I first saw side stripe pants on a model, in a magazine, and online, I knew it would become a hit. And yes, my theory turns out to be true. Now that I'm infected and got so carried away, I started thinking of having this trend in all kinds. These awesome, fashionable, premium denim jeans I found in a messy pile of pants in Zara. They're oxblood, they got black rubber stripe on each side, they're perfect! Let's move on, because I still have so much to talk about. See that fierce-looking fox on my sweater? That's trend number #2. Even when the weather is boiling, I still couldn't leave this piece in the corner of my closet. In case you didn't know (I believe you do know), today world trendsetters are embracing their animal-instincts through fashion. No longer shown in patterns, now animal graphic items come in such a brand new fashionable way. Spotted top style bloggers and celebrities in Rottweiler pieces? Yes. They're Givenchy. 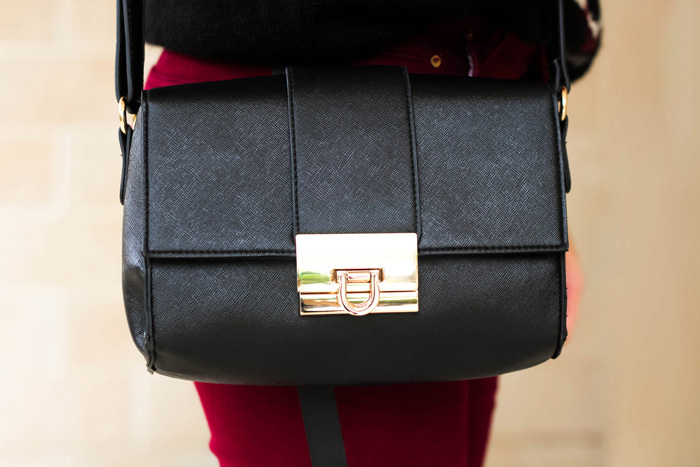 Last, not least, one of the biggest accessory trend this year, black bags–in my case, small black bag. Just like what WhoWhatWear stated, "black is the new black". Versatile yet fashionable, what could possibly go wrong? I absolutely love this whole outfit. The pants and bag are my favorite. Great styling. Thank you! Love those jeans and bag too! Beautiful outfit! You look gorgeous. Lovely photos! love the bag - so cute. I love your sweater! very nice outfit. Love your pictures and how you do the title in the image. I do the same thing you should check it out. This sporty chic looks so good on you! Loving your blog, doll! Thanks! I'm flattered that you like it! great outfit! love your sweater! So nice!!! I love it!! Looking amazing. Work it :)!